This vest was used in a western wedding and it was fantastic! The vest is made of very good material and the fit is spot on. Don't be afraid if you are considering this vest. It's awesome. I need 5 vests before a wedding and fast. The customer service rep went above and beyond to get them to me in a hurry and they arrived in plenty of time. Will use again. These ex-surplus goggles are of course very authentic. They are even supplied with a small storage tin for safe keeping! This is a high standard reproduction gunners coat made by Kakadu in Australia. The gunners coat was worn by Australian infantry in WW1. Very well made! Very happy customer! 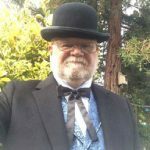 I'm involved in a number of victorian events and was looking for a nice set of "Tails". I recieved my Tailcoat from the Emporium and am pleased to say it is every bit as nice as the Rifleman frock coat that I purchased previously. The coat is stylish and classy and I will get a lot of use out of it in my various victorian organisations. I'm half way round the planet and the delivery time was extraordinairy. Thanks so much for your great service, products and fast delivery. The slacks were labeled incorrectly, but great customer service saved the day. Thank you! Simply perfect, great quality, timely shipping, AWESOME customer service! Very please with this product. Very nice quality. This was one of the best purchases I have made. The tie went well with his outfit. My daughters and I had been looking for quite some time for a great pair of western culottes (like you always see on the old cowboy shows) when I finally came across this website. They are PERFECT! Just what we were looking for. Now we can be both modest and look stylish while we trail ride! They are very nice and well made. The price is very reasonable. They look like they will last a very long time. Truly, I can't say enough about them. I do, however, recommend as it says in the description that anyone ordering these should order a size or probably two larger than they normally wear. For instance, my older daughter normally wears a size 4 and she took a size 8. I normally wear a size 4 - 6 and although I could wear the size 8, I felt more comfortable in the size 10. We will definitely be ordering more in the future! We stumbled across this website recently and loved it! We like all of the old west products sold here and ended up ordering some of the classic riding pants for my daughters and I. They were just what we had been looking for. I have to say that the culottes were very well made and very reasonably priced. I received wonderful service over the phone. My order got here surprisingly quick and well packaged. We have fun just looking at all of the neat things on the website and will definitely be ordering from here again. Just received it today. Much nicer than expected. Should help keep me warm during the Afghan winter this year. Gets cold up here in the mountains without Momma ta keep me warm. :) I now have 2 of these vests. 1 to keep nice for dress up and 1 to wear at work. A real bargain, Quality piece. Thanks again! I had an interesting experience in that my vest was stolen off of the UPS truck. I called them and they were very helpful and got it shipped to me on time. Great people, they answer the phone and know what they are talking about. This item is great as far as quality of materials is concerned. Labeling it a 3XL (meaning tall) is a little misleading. I am 6'7" and the 3XL comes to my belly button. The fit was perfect and the comfort level high. Went great with my steampunk vest and tailcoat. Buttons fell off first time I put it on. Lucky wife new how to sew and saved the day. The sleeve garters are a perfect accent to my costume. The bow tie is a great addition to my theatre costume. I have shopped here for items to complete costumes used in my theatre company and have always been satisfied with the quality of the products received and the service given. I will remain a customer and have already recommended this site to others. The boot was very nice and it fit my foot comfortably however....where my foot was the right size,my calf was not! Such is the burden of stout ladies whether from the 18oo's or the 21st century! I received so many compliments on these boots that I wore to my daughter's wedding. They were so comfortable I didn't even have to take them off.....even after hours of being on my feet & dancing!!! I am extremely pleased with this vest; it really is quite striking and the pictures on the website do not do it justice. It is well-made and of high quality. It's also quite verstaile; I originally bought it to complement my Dracula outfit for Hallowe'en but have already worn it for other, more formal occassions and it was constantly commented upon! The shipping is super fast and I received my order in two days. Extremely pleased with the customer service! I will definitely be doing further business with Historical Emporium! love the classic work vest. fit is great. excellent customer service. My uncle was one of the last hard-suit divers in the Navy - this is a perfect little gift for him, to go with the amazing hard suit helmet on his desk. It is detailed and exact, and has a surprising weight to it - very nice. I bought these for a show I am in and they're just what I needed. The size was just right - and the boots are comfortable for walking as well as dancing. Vest is great, at a great price. Loved the tie. Great color and easy to wear. Works best with a high cut vest. This is an excellent coat, it goes well with steampunk, wild west reenactment, and as a proper coat when wearing a kilt. I am looking forward to wearing it this winter, we give or coats a workout in eastern Minnesota, and this overcoat is up to the job. It roomy cut allows you to comfortably wear a jacket under it. Either for formal dress or just for warmth. It is well made and the pockets are proper sized. For snow I plan to Scotchgard it to help it hold up better. I just love the look of this coat and it defiantly gets peoples attention when you wear it out for dinner. I was more than happy with the Felt derby. It really made my outfitt stand out. For a costume straw boater, this is a great product. It is not the extremely stiff straw of a true Italian boater, which typically cost over $100, but this is a decent reproduction. The straw is stiff enough to look like a real boater, but if you have ever held a "real boater" you will know the difference. From a visual inspection, it looks like an exact replica. You can replace the blue/red ribbon around the hat in order to match your costume/outfit. Very comfortable to wear as well. my girlfriend and i have been shopping around to build more on our steampunk personas when i happened across the historical emporium. I'm hooked. Everything i purchased i am happy with. All items are true to size and of good,solid construction. I e-mailed the emporium with questions regarding my order and received a straight-forward response from a living person within the same day. Over all i will most certainly be ordering from the emporium in the future and will recommend this excellent place to all of my friends. The neckerchief was exactly what I anticipated. Also, we appreciate the prompt shipment. Sorry to report that I returned the vest. The workmanship and quality of the vest was great, however the size of vest was not even close to normal size. I consistently wear a medium in shirts, jackets, etc. Your vest was so small there was no way it would button and was at least 2 inches short in length. I ordered the vest for a wedding and did not have enough time to place a second order. Anyway thanks for the opportunity to return. These are authentic looking, rustic but sturdy and well crafted. The only reason for four stars instead of five is that the straps/buckles don't allow for a secure fit on someone w/ very thin legs, even over a thick pair of trousers. Still, this can be worked around, and the product is highly recommended. This is a very well made jacket. The stitching is excellent and should provide for long term casual wear. The only thing negative is I expected the light tan as pictured on the web sight. What I received was the dark British tan jacket. No big thing though, it will serve well as a military jacket as worn by the British troops in India. You folks are TOP DRAWER. Keep up the superior service. Hello, there. We are very pleased. You should know that all these things are for our wedding. We are getting married in New York, in Time Square. After a long search for steampunk clothes, my partner Ramiro found you guys and ordered a few things himself, after I told him not to. What can I say, he wins! He was right. This is exactly what we wanted. So we continued to order the rest of our outfits from you guys, and so pleased that we did. Thank you for being such a big and important part of our wedding. I decided to purchase from this vendor because I needed a brown leather vest. For some reason finding a leather vest in the color brown is rather difficult in my neck of the woods. I first ordered a vest according to the size chart posted on their site. (A word of caution, go one size up with these.) After waiting forever for them to ship it (It takes them days to process your order and get it shipped out and there is always an excuse.) it showed up and as I previously stated it was too small. I contacted their customer service line and the male that answered my call just referred me back to the website to do my return rather than handle the issue while he was on the phone with me. I then went back to the website and found that they suggest that you purchase the item again in the right size rather than wait for the entire return process to be done. (This is obviously because they are aware that their processing and shipping is sub-standard.) Anyway, since I need the brown vest I found myself ordering the correct size and paying for it again and shipping the other vest back for a refund. I shipped the return back the next day and wouldn't you know it, my return made it to them before they even shipped the replacement out! As of today the replacement still hasn't arrived (14 days into this) and I'm in a hole for the cost of two vests and double the shipping costs as they still haven't credited my return. Never again! A VERY nice suit. Excellent tailoring. Smooth and stylish. I will definitely order from HE again. Truly wonderful service. Staff was very knowledgable and extremely friendly. Package arrived quickly and safely. I look forward to shopping with them again soon and would recommend them to everyone! The hat arrived and was exactly as described by the online catalog. Looks and fits great, very pleased with it. I was shopping online for something cool and unusual and found your website, which has some fascinating items. I bought a hat, which I am very pleased with, and it arrived even before I expected it, very fast service! I will definitely shop with you again and recommend your store to anyone looking for unique items. Love this hat. I thought the medium might be a little too big, but it turned out to fit perfectly! WITH THIS LAB coat, I WILL TAKE OVER THE WORLD! I MEAN - IT'S AWESOME! MUHAHAHAHAHAHAHAHAHAHAHAHA! NOW TO BUILD A DEATH RAY! AND A ZEPPELIN! I ALWAYS WANTED TO BE A MAD SCIENTIST. I THINK I GOT THE MAD PART DOWN. STILL WORKING ON SCIENCE. WELL. I'M DASHING WITH APPLIED SCIENCES. MUHAHAHAHAHAHA!!!! I ordered the best in the long version of my normal size. This vest was barely long enough but was far too small around the waist. I then ordered two more vests, one size bigger and two sizes bigger, but they were not available in longs. The one size bigger vest was fine around the middle but was terribly short. I ended up sending all three vests back. I understand the vests are cut shorter in the old style, but I think these went to extremes. I'm only 6'1" so it's not like I'm overly tall. I would have had to wear pants almost up to my chest for the regular length vest to work. The color of the vests was terrific - every bit as brilliant as you see in the photos. I wasn't really thrilled with the material though. It was very thin and flimsy . . . it wouldn't hold up to more than a couple CW reenactments, I'm afraid. It felt like a cheap costume rather than a real vest, and for the price I expected better quality. If you're shorter than average the length may not be a problem. If you're average or taller you really need to go with the LT version of the vest and hope it fits. Expect to order one size bigger than you normally would as well. If you need the vest for a one-time use and you can get one that fits, it will work very well for you. If you plan to use it for multiple events I think you'll be disappointed in the material. Gotta love the color though, and the vest looked very nice. I wish I could have made it work. It was perfect for our wedding. I am very happy with the softest suede riding pants. The pants feel and look elegant! Size was perfect. thank you! This isn't my first purchase from Historical Emproium nor will it be my last. I'm always pleased with the quality of the garments I receive as well as the super-fast shipping. This very looks great with nearly any shirt and I wear it often. It's well stitched and sturdy. My only complaint (and it's not a complaint) is the buttons are plastic. If it were that important to me, I'd replace them. It's a fine vest. was great on phone, delivered on time when asked to, no problems with shipment. I ordered these classic 19th century trousers for a Ball I am attending and they are exactly what I wanted. The sizing, color and fit were spot on. Shipping was fast and efficient and over all I am very pleased with this purchase. I purchased from Historical Emporium because the items seemed classic, unique, and offered "steam punk" fashion. The website is wonderful. I love the characters it brings to life and the outfits it puts together. The purchase exceeded my expectations in fit, comfort and style. Unfortunately, the items do not retain their color well when washed. The service is good. I will absolutely shop with you again. And, I've already recommended you to my friends (especially the ones who comment on my clothes). Exactly what I expected and even more because it is very comfortable. Fits greatly with jeans ! Very good one. Maybe a bit hard, but then also tough, what it is supposed to be ! This is a wonderful tie Tack. This is clearly the best customer service I had to deal with. Even if it was not easy to solve my problem via emails and because I live pretty far from the store itself, the person who took care of my issue, Christine, has been very effective and pleasant, answering immediatly and offering a variety of resolutions. Thank you again ! This vest is very well made and perfect if your not looking to be to garish.Historical Emporium does it again!! Love this shirt a lot!,i can not say enough about it.I will be sure to use it in one of my violin performance in the future. This holster is beautiful! I love it. It is well made and fits perfect. I will order more!!! I found you on the web. My holster is everything I expected and more. You provided great customer service and shipped my package promptly. I will shop many more times from you. I will recommend you to all my friends and family. I bought this shirt for a Halloween costume, it was very nice. The sizing chart was very accurate, it was a nice fit. Very happy with the shirt. Very pleased with the quality and fit of these items. Delivery was fast and could not have asked for better service. AWSOME. I loved it. It is very nice quality for the price. I ordered some stuff for a Halloween costume. It came very fast and was all correct. I will be ordering from here again. I was absolutly satified. I found this site on the internet when searching for riding pants and I was intrigued by the name, "Historical Emporium". The purchase exceeded my expectations and I would shop with you again and would recommend you to others. I appreciated the excellent packaging and especially the free hangar! GREAT SERVICE! This vest is perfect for my needs. The fit is true to size. Colors as described. Thanks for the quick shipping! I love it. You guys are the best, I'll be back. This is a top quality product at a reasonable price. Highly recommended. Very good fit and quality at a good price. Compared to other eye wear products I've purchased from the Emporium this one is a little toy-ish for my taste, but as part of a fantasy costume does the job it's intended for. This telescope deserves a 10 out of 5 in my books. Everything about it is outstanding. I was also very impressed by the lenses zoom quality. The skirt arrived promptly and my wife loved it. If your looking for period clothing, shop here first! Quality clothing at an affordable price. I am very pleased with my recent purchase of the "Classic Gibson Girl blouse" in white. I was truly delighted to have received my purchase so quickly, within a few days of my ordering it, and was absolutely pleased with the feel of the fabric and the obvious quality of the blouse. It is very well made, the size was accurate, and I love it! I will be placing another order for a skirt in a couple days, and I'm sure it will meet my expectations. I will be hand-quilting in one of the cabins at the Washington Parish Fair in Louisiana in mid-October, and I needed 1880s-style clothing. I think my blouse and skirt will look awesome, and I am so excited and looking forward to wearing my new outfit! Thank you very much; it is a pleasure doing business with you. Although I did not have direct contact with a person at your business, I will definitely recommend your website to others (and I have). I will make another purchase within the next couple of days, and I have no doubt that my skirt will be of the finest quality, as was the beautiful blouse I purchased recently. Your company was recommended to me by my brother, as he has made purchases from you previously and was also very satisfied. Excellent service, excellent quality, received purchase very quickly. Thank you! Crisp and white with good heavy fabric and buttons, worth the price. They are what they are. Worth the price but nothing special. I'm very pleased with my stagecoach suspenders. They are well made and look great. I'll wear them with pride. Thanks for carrying such a fine peice of period clothing. Wore it to a historical ball. This vest is well made and comfortable to wear. The front panels are quite thick so would be better suited to a cooler climate, rather than my Australian summer. Also the quality of the buttons was sufficient and none fell off. Over all I'll get plenty of future use out of it. I wore this coat to a historical ball where I called the dances. I received quite a few compliments on how good the coat looked. The buttons are great if you don't pull on them, but could look a lot better with a nice set of silver ones. Rather satisfied with the service too. I am very pleased with my new shirt, the quality, service, fast delivery just everything is great. This is the second shirt I have bought and love both of them, I just wish I were not on a fixed income and I would own more of your items. I have told all my friends and family about this store. I will be ordering more as I can. Thanks for handling these great products. These were the second set of spats that I ordered from you guys and I couldn't be happier!!! They are constructed extremely well and the canvas is nice and heavy, making a very cool statement. They button easily and are perfectly sized. Thanks so much for your company and excellent customer service!! I will be ordering from you again very soon!! I hesitate to give a positive review of these pants for fear that they will sell out before I have a chance to buy a second pair! The colors are much richer than pictured, and are primarily a bluish grey and khaki/tan, with gold and black stitching. Fit is perfect. Fabric is lighter weight than expected, but that's fine by me. Really cool pants, I like them a lot. I can't find this quality anywhere at this price. I own $300.00 scarfs and you cant tell the difference. I like Historical Emporium shirts generally, but this one is a little disappointing. Although it's theoretically my size (and other HE shirts I've had have been fine), it's too large in the body and way too short in the sleeves. I'm still wearing it with the sleeves rolled up, but for me this one isn't your best. This is a very good shirt for the taller man. The overall length is great, as is the sleeve length. The fabric is quite heavy so I don't think I'll be wearing is much when summer arrives, but no problem in the colder months.